Select a State Route which will be shown on a map. Select a route Segment above or click route segment on map. Disclaimer: This web site is for informational purposes only and may be viewed by anyone. The Pavement History information is provided "as is" without warranty of any kind, either expressed or implied. Information could include technical inaccuracies or errors of omission. Likewise PennDOT makes no warranty with respect to the Pavement History information, including its quality, merchantability, or fitness for a particular purpose. Pavement History information is provided "as is" and the user assumes the entire risk as to its quality and performance. Changes may be periodically made to the information herein. Welcome to the Pavement History Straight-line application. 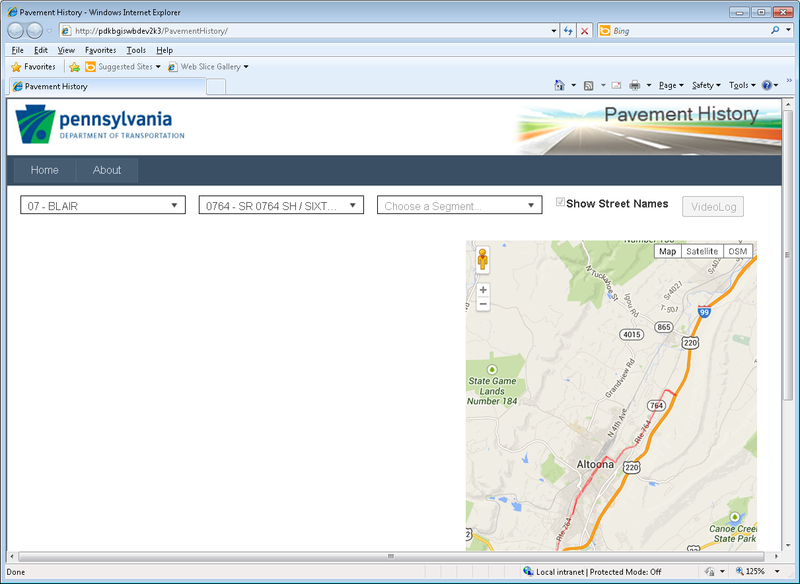 This application provides a quick solution for identifying approximate PennDOT highway segment locations and displaying the pavement history for that segment. 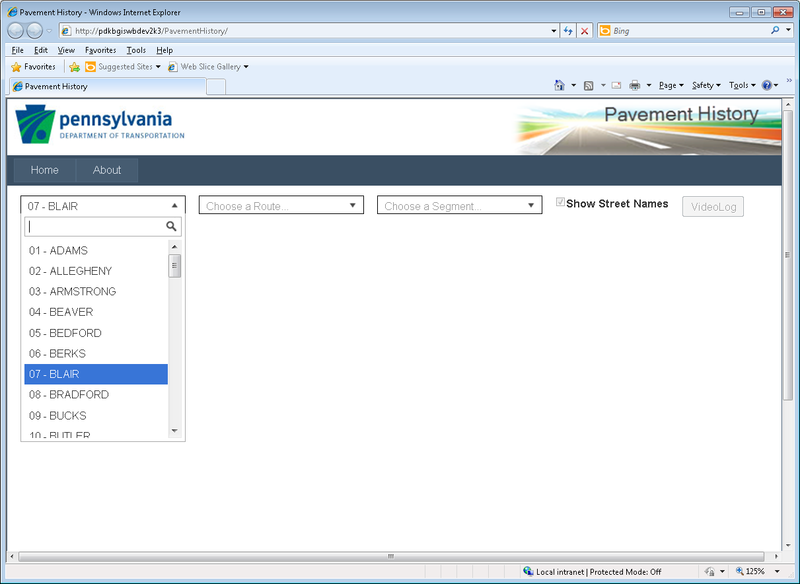 It conveys location through integration with Google Maps and Streetview, PennDOT’s Roadway Management System (RMS), and PennDOT’s VideoLog application. So let’s get started. First you will have to identify your segment of interest. At the top of the entry page, you will notice three pull down boxes, one for County, one for Route, and one for Segment. Begin by selecting the county the road is within. 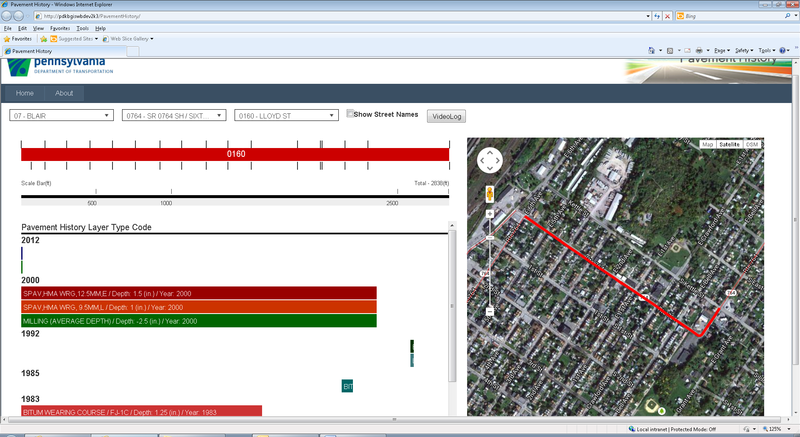 This will then filter the Route pull down box to only display only routes within that county. Select your Route. A map will appear highlighting the route within the county you selected. If you know the exact segment, go ahead and select it next. 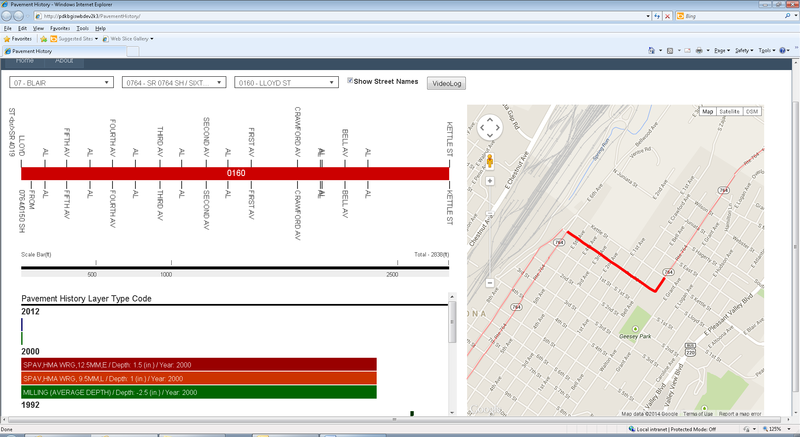 If not, select a segment directly off the map, pavement history for that segment will be loaded onto the web page. In the following example we will locate Blair County, PA Route 764, Segment 0160. You can zoom in and out in the Map using the standard Google Map methods – rolling the mouse wheel, and so on. You can load Google StreetView into the map by dragging the Yellow Man to a blue highlighted road. You can access PennDOT’s VideoLog for your segment of interest by clicking the VideoLog button. 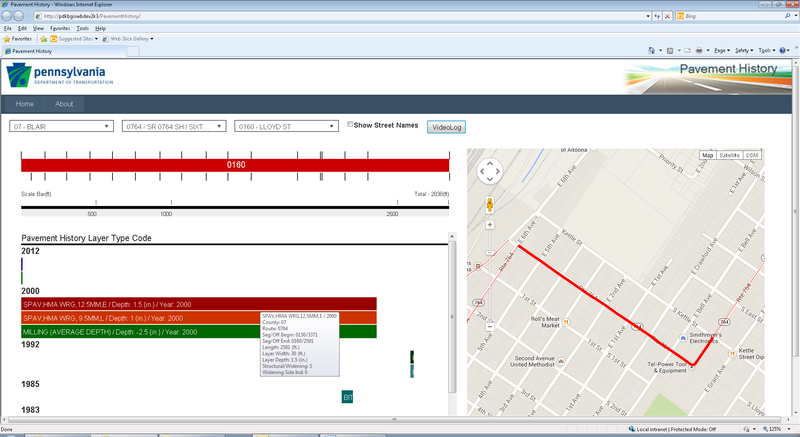 You can get a larger pavement history area by unchecking the Show Street Names box at the top. For additional reference, turn on the Satellite View. By holding your mouse over a Pavement History Segment, additional information is displayed as a tool tip. 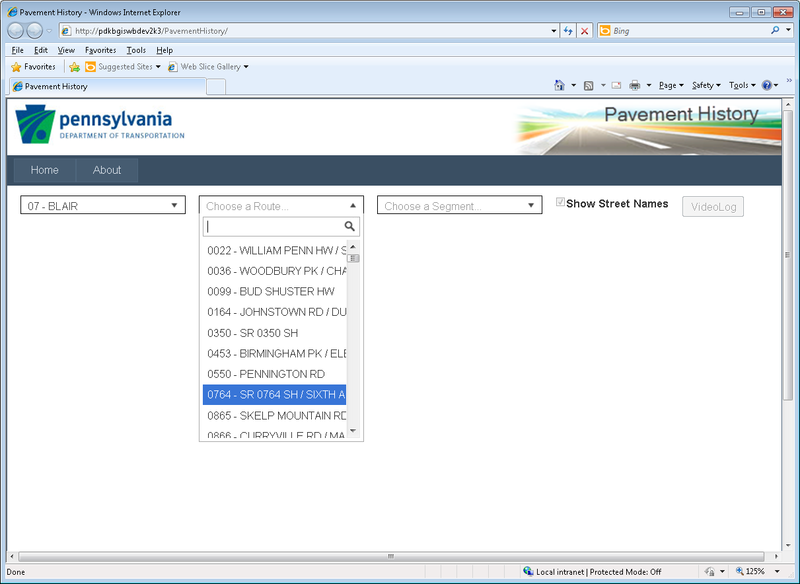 By clicking on a Pavement History Segment, the additional information is displayed in a formatted manner for copy and paste into reports or documents. To select another Segment on Route 764, simply pan the map and select the new segment from the map, or use the Segment Pull Down. With the Pull Down boxes, you can select a different County and Route or change the route within the same county. The option is yours. Finding Four Digit State Routes (Quad Routes) is not always easy, but you can streamline the effort. 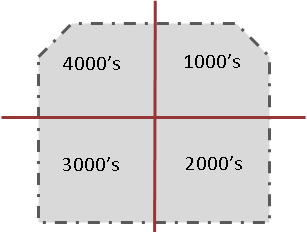 Picture the county as a set of quadrants, the upper right quadrant will have route numbers in the 1000’s. Then moving clockwise the lower right will have the 2000’s, the lower left 3000’s and finally the upper left 4000’s. Delete this from the Template ?